Magnetic fields are produced by current, which is the flow of electricity. Current, which is measured in amperes (amps) can be likened to the volume of water flowing in a hose when the nozzle is open. Generally, the higher the current, the higher the magnetic field. The Earth's natural magnetic field is approximately 50 µT in the UK. Anything which uses or carries mains electricity is potentially a source of power-frequency magnetic fields, which modulate the Earth's steady natural fields. The strength of the magnetic-field modulation depends on the current (often referred to as the load) carried by the equipment. In the case of a power line, this varies according to the demand for power at any given time. Magnetic fields are little affected by trees, hedges, fences, and ordinary building materials – unlike electric fields. More on screening fields. 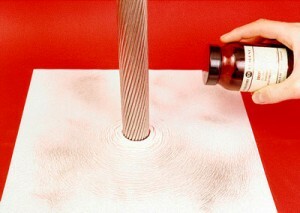 You can see the magnetic field from a 50 Hz current by sprinkling iron filings on a piece of paper, just as we all did with a bar magnet in physics lessons at school. But the field is a lot weaker. To get this picture, we had to pass 5000 amps through the conductor, and even then you can barely make out the field lines. The field lines from a single current form concentric circles - contrast this with the complex pattern created when you have multiple currents on a real power line.